In a discouraging post mortem, it turns out neither the U.S. economy nor the environment really benefited from the 2009 “cash for clunkers” car-trading scheme. “Cash for clunkers” was wildly popular when the federal government instituted the vehicle trade-in program in the summer of 2009. Congress first earmarked $1 billion to lure drivers out of their old gas-guzzlers onto depressed car lots and into new fuel-efficient vehicles. Designed to run between late July and early November, the program burned through that money in a week. It ended less than a month later, after 678,359 new cars were purchased in exchange for $2.85 billion in government rebates. In retrospect, though, a popular program (which still had its critics) isn’t the same thing as an effective one. And a new paper concludes that “cash for clunkers” did little for either of its true intended beneficiaries (beyond those 600,000 happy customers, that is): the economy and the environment. In a newly updated study from the think tank Resources for the Future, Shanjun Li, Joshua Linn, and Elisheba Spiller examined the program against a counterfactual world where it never existed, drawing on trends at the time from Canada. They looked at the total sales from the program (a reflection of its economic impact) and at the composition of the vehicles sold (a sign of environmental impact, based on improvements in fuel economy). As critics of the car-rebate plan warned at the time, many of the people who took advantage of the program were on their way to buying new cars anyway. The researchers found that 45 percent of participants would have bought new cars in July and August whether the program existed or not. The rest of these people likely would have bought cars at some points later in 2009, but thanks to the promise of a $3,500-$4,500 rebate, they bought them while this deal was on the table. This means the program didn’t give much of boost to the auto industry – or the larger economy – beyond concentrating several months of car-buying demand into the program’s brief lifespan. This has been one of the key criticisms of clunkernomics. There are other potential economic benefits that come from transferring $3 billion from the government’s coffers to peoples’ pockets. Perhaps families took that $4,500 they saved on a new Camry and instead spent it on a new washing machine and a vacation. But if the goal of the program was to spur people to trade up from clunkers they’d otherwise been planning to drive for another few years, this research suggests that simply did not happen. The authors did find that the program had an effect on the vehicle choices buyers made. But these results are discouraging, too. Among all of the cars bought in the U.S. in July and August, the average fuel economy was only 0.65 miles per gallon better than it would have been among newly purchased cars had the program never existed. Averaged out over June through December, that number falls to 0.23 miles per gallon. 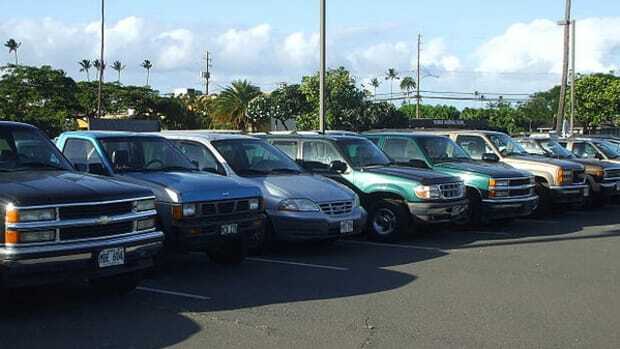 Over the lifetime of these vehicles – and depending on exactly how long people keep them and how they drive them – cash for clunkers will have paid $91 to $288 per ton of carbon dioxide saved. The lesson may be that in trying to serve multiple ends, the program didn’t do a very good job at either one. A stimulus package launches with low hopes for qualitatively changing the pace of car buying and little real expectation of cleaning up the air. Cash for Clunkers: Invitation to Fraud? The Germans already have a program for taking gas guzzlers off the road and replacing them with shiny new cars, but there are some bumps in the road. Now that Uncle Sam is no longer a back-seat driver for the auto business, this is a good time to pull over and remember one of his signal acts while in the car. The federal government has unveiled updated designs for those informational stickers on new cars. The hope is to nudge buyers into choosing more fuel-efficient models.